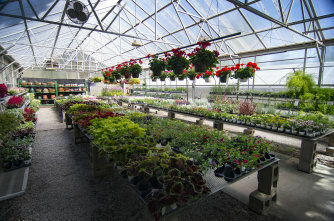 Hillside Nursery has been part of Wichita for nearly 100 years; a beautiful oasis reminiscent of Kansas country living. At Hillside Nursery, you will find many surprising and useful facilities for your shopping convenience and pleasure. Kansas certified nursery specialists oversee every aspect of the growing process to assure trees, shrubs, and flowers of the absolute highest quality. We offer the states finest selection of field grown specimen trees and shrubs complimented with many excellent container-grown materials. During the first years of business our South Hillside location was rural, surrounded by fields of golden wheat. Wichita has grown around us, to give the Nursery a convenient location a mile east of Interstate 35. Our tree farm in Derby Kansas allows us to offer both common and rare nursery stock that is highly acclimated to the unusual conditions that exists is south-central Kansas. From the beginning Hillside Nursery's philosophy has been to offer the best nursery products and advice in a friendly and helpful environment. Our knowledgeable staff can assist in all areas of landscaping, including design, planting and horticultural problem solving, to remedy the smallest to the most complex gardening problem. Each distinct season offers a unique experience at Hillside Nursery. Winter time finds us busy doing our own in-house propagation in our warm greenhouses preparing future trees and shrubs for planting in our growing fields. Trees and shrubs may also be planted throughout the winter with great success as long as the ground is not frozen. 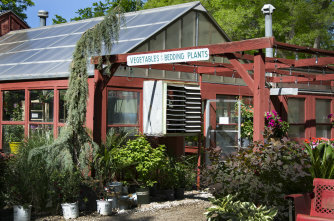 Spring is a whirlwind of activity and our favorite time as the nursery become an abslute destination of area gardeners! The lazy days of summer are spent maintaining our landscapes, enjoying watching things grow and continuing planting. Autumn brings an absolute stunning display of rich changing colors of our mature trees, huge displays of flowering fall mums, pumpkins, corn shocks and straw. Christmas at Hillside Nursery is a family tradition! Choosing from an excellent variety of our live potted trees or fragrant freshly cut premium pin or fir trees, wander the grounds munching on fresh popcorn and sip hot cider as you choose fresh wreaths, greens and poinsettias for your home decorating. Be sure to see how trees can be flocked with snow and strung with lights for a gorgeous winter effect! 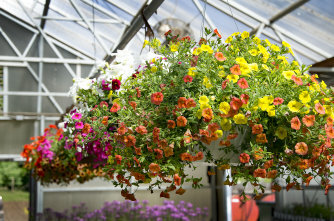 We offer a great selection of hanging baskets for your home or patio. 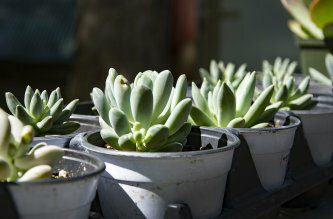 We have a great selection of succulents, they are a great low maintenance plant. Spruce up your porch, yard, or garden with a themed garden stone. 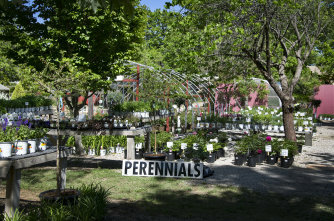 Perennials are a great addition to any home or garden. 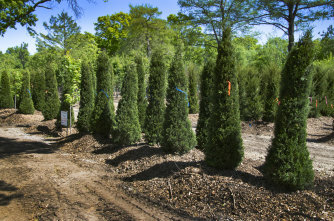 We carry a large selection of Evergreens and other trees. Give the gift of green! Contact us today at 316-686-6414 to purchase yours.